Sometimes I think about switching to colour comics- then I remember how much longer colour comics take. I just eat the tail. I have no problem with this, though I prefer to do it with shrimp that have either extremely crispy or extremely soft shells. I use the power of suction (and my teeth) to pull the tail meat out. Works for me. Wait a second… Do you want to tell me that some people don’t eat shrimps like that? What a waste of wonderful fish. You’re missing the part where you bread and fry them. Annnd now I have a terrible craving for popcorn shrimp…. Try not to eat long john silvers. Maybe because I’m spoiled with true blue alaskan shrimp that you can get yourself by paying a fisherman for some by the docks, but Long John Silvers never clean the… “digestive tract” of any of their shrimp. Shrimp are usually found where our “waste” is dumped into the sea. Fisherman haul them out of there and then long john only cooks the shrimp. long john silvers sells poo shrimp. thus long john silvers is poo. Get some prawns at New Segaia! Freaking Delicious! I got some good news… I’m Jewish, a picky eatter, and totaly grossed out by the idea of anything that walks on more then 4 legs… More shrimp for you guys! 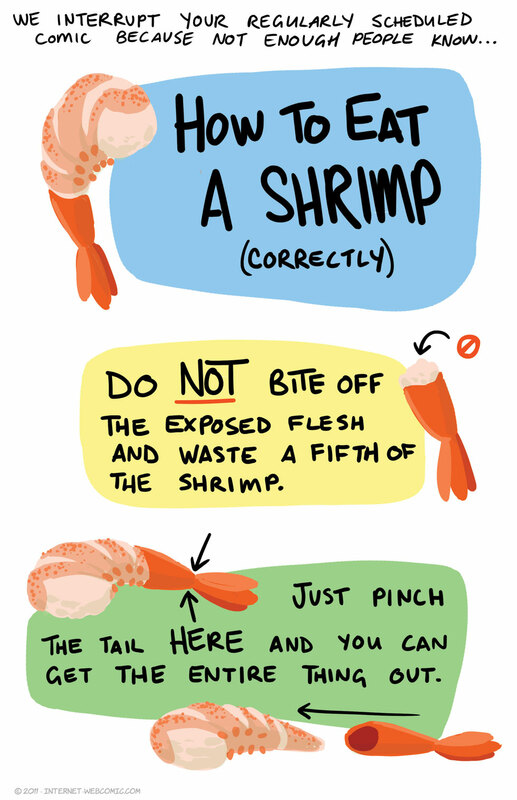 Today I am going to eat a whole bunch of shrimp just to offset all those extra shrimp left uneaten by you. I just peel the tail. Slowly. That’s how I deal with most seafood, actually. Slowly. I agree with McFrugal (great handle, btw), I behead and de-limb the thing, steam/boil it/them, and then eat the whole kajigger, shell and all (more shell than pictured above). The shell is actually really tasty, and contains TONNES of calcium. One just needs to be careful of the sharp bits, aligning the prawn properly within one’s mouth to avoid gum-jabs. I remember growing up on the north end of Vancouver Island (BC, Canada), in Port McNeil. The town was a stopping point for many many fishing and prawning boats that worked off of Alaska and Haida Gwaii (Queen Charlotte Islands), so we constantly had access to fresh, LIVE prawns at really low prices. We’d go down to the gov’t wharf (oh you red pilings..) and buy two huge grocery bags FILLED with living prawns, take them home, pull the shower curtain closed, and let the prawns flip and fly around (they’re strong!) in the tub before we cooked and et em. Well, it’s aquatic. With which I mean, it lives in water. And is delicious. Evil shrimp. I avoid them. They try to kill me from the inside (allergic).